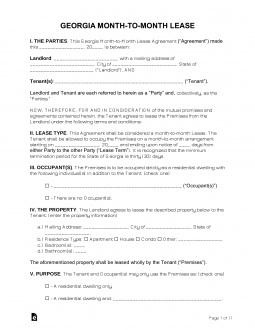 The Georgia Month-to-Month Agreement Template can be used as a measure between a landlord and tenant when wishing to document a temporary leasing arrangement that may also be considered long-term. This is done by having a lease which will only require a termination letter and the state required notice to terminate the agreement to end the arrangement while also automatically renewing at the end of every month. Thus, the tenant will pay for the month they will stay in advance and either party may terminate this rental arrangement by giving thirty days’ notice at the end of this period and the landlord must give sixty days’ notice according to § 44-7-7. The reason for the notice requirement is clear. A rental agreement has a drastic effect on both party’s finances and quality of life. Additionally, both will need the time to absorb the change. That is, a landlord will need to find a new tenant while a tenant will need to find a new place to live. In many instances, thirty days may be considered a reasonable amount of time to achieve these goals. The agreement itself is a fully operational lease which will define the landlord and tenant role and obligations. The only real difference between a month to month and a standard lease agreement is that a standard lease agreement will have a fixed term or set amount of time requiring a certain amount of money paid to the landlord by the tenant during a time period which must run its course and expire naturally. Full name of the property owner on the first blank line. Street address of the property on the third available blank line. Step 2 – In item 1, enter the monthly rental amount, calendar day of the month the rent will be due, then the day month and year the lease will terminate. Step 3 – In “Payments,” enter the address where the rent must be paid and how the payment should be submitted. Then enter the dollar amount for the first month’s rent, the security deposit, and any additional charges the landlord has required from the tenant in order to enter the lease agreement on the appropriate blank lines. Then enter the total of these payments. Finally, enter who the payment must be made payable to. Step 4 – In the “Late Charge” section, enter the dollar amount the tenant must pay if rent has not been submitted on time on the first available line. The next blank line will require the maximum percentage of rent the late fee may not exceed. Next enter the day of the month when rent will be considered late. Finally, on the last line enter the penalty fee the tenant must pay should a check they have submitted be denied for insufficient funds. Step 5 – In “Occupants,” enter the full names of any people and/or animals who will be allowed to stay in the residence without the written consent of the property owner. Step 6 – In “Pets,” enter the dollar amount of the deposit required if the tenant wishes to have a pet on the premises on the first blank line. On the second blank line enter the rent increase amount that shall be added to the rent when a tenant wishes to have a pet. Step 7 – In “Parking,” define the location or identifying number for the parking space that is granted to a tenant renting this property. If there is an additional monthly fee, it should be entered in the second blank line (located in parenthesis). Step 8 – The next section to require attention shall be the Lead “Notification Requirement” section. Here, verify the tenant has been given the “Lead-Based Paint Disclosure Form” and the “EPA Pamphlet” by placing a checkmark in their respective boxes. Step 9 – If any condition, terms, allowances are part of the rental agreement between the tenant and the landlord, report them in the “Additions and/or Exceptions” section. Step 10 – The next section “Notices,” shall report how notices will be issued to the tenant from the landlord. In the space provide, enter the address where a landlord shall deliver notices to a tenant. If the notice will be posted, then be very specific in describing where the tenant should check for such communication. Step 11 – In the “Inventory” section, report the items on the premises made available to the tenant for their use (i.e. refrigerator, stove). Step 12 – The “Keys and Addendums” section shall define what has been made available to the tenant that directly relates to their day-to-day living. If keys have been given to a tenant check off the first box then, in the space provided enter the number of keys and the purpose of each key (key to check mail, key to open front door). If the tenant has been given a set of rules check off the second box and if a tenant has been given a copy of a pet agreement check off the third box in this section. There will be a fourth box next to the word “Other.” This is reserved for any documentation given to the tenant that has not been previously mentioned (Note: this box must be checked and the document must be described in the space provided if it is to be part of the lease). Step 13 – The final section, “Receipt of Agreement,” shall require each resident participating in this lease agreement to sign their name and enter the date of the signature. The owner or official landlord must do the same in the space provided directly below this.